Almotamar.net - President of Aden University Dr Abdulaziz Saleh Bin Habtour on Sunday praised efforts o he preparatory committee for the third conference on blood diseases and tumours to be organized by Aden University on 16-18 February 2010. 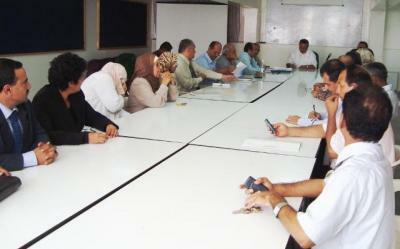 In the meeting of he preparatory committee chaired by Dr Habtour he said the conference would be distinguished with regard to preparation and the level of the scientific participation because it comes at time of Aden University celebrations of its 40th founding anniversary and the 20trh anniversary of the Yemeni unity. Dr Habtour touched on the importance of the conference and the expected results the conference would reach for limiting blood diseases and tours (cancer) and knowledge of the causes of these diseases.